I am working on a game opinion summaries / first impressions article for my newest (old) console, the Intellivision. It shouldn’t take too long, but in the interim, though, how about this thing? Working on my Guild Wars screenshot series has made me look for old screenshots I’ve taken of other games, but unfortunately I took almost none. I’ve never filmed myself playing games, and I only have a small handful of images of high scores and such I’ve taken, my many hundreds of Guild Wars images, and a few others, including the ones in this post and some from the Guild Wars 2 betas. Those latter ones are for another time. Online RPGs have been around for decades. Apart from a few games such as Cavequest, Castle of the Winds, and Quest for Glory I, however, for the most part I did not play RPGs in the ’90s on our PCs; I mostly stuck to platformers, strategy games, shmups, racing games, adventure games, and such. As for console RPGs, I wouldn’t be at all interested in those until the ’00s. I love Quest for Glory, but it didn’t get me to play other RPGs; that is a somewhat unique game series, being a hybrid of RPG and adventure. When Baldur’s Gate released in 1998, however, this changed. I had an interest in Dungeons & Dragons, though I hadn’t played much of the pen and paper game, but the mid ’90s were not a good time for D&D games; there had been good ones earlier on, SSI’s Gold Box series particularly, but I didn’t play those in the early ’90s, and they probably would have been too much for me anyway. Anyway, Baldur’s Gate interested me in a way that RPGs hadn’t before, so I wanted to play it, but not so badly that I was going to spend $50 for the game. Unfortunately it didn’t have a free demo, so, I bought the retail expanded demo version, Baldur’s Gate Chapters I & II. I liked that, so I bought the full game in ’99. I loved the game a lot and it’s still a favorite of mine, but I must admit I never finished it; it’s pretty non-linear, and after wandering around in the forests a lot I eventually lost interest. It’s a great game I mean to play someday, though. I usually have preferred a somewhat more linear, directed experience over a very open-ended one. I also don’t care much at all about loot and don’t play games a game just to get better items or “collect them all”, and I do not like grinding experience either. I also quite dislike crafting unless it’s very simple. I love history and the middle ages has always been my favorite historical period, but while I like some RPGs, I’ve never loved the genre as much as some do. And that gets us to MMORPGs. Right from when I first heard of them, I wasn’t all that interested in actually playing online RPGs myself not only because I wasn’t a big RPG fan but also because the kinds of games they are run directly against what I like in games — they are all open-ended, with an endgame where loot is often your main draw, after all. So, for years I did not play them. By 2004, however, I was interested enough that I wanted to try some… and then there was that Guild Wars alpha test in May 2004, with a no-monthly-fee game made by former Blizzard developers, my favorite game studio then thanks to their amazing RTSes! I had to try it, and the rest was history, as the Guild Wars Screenshots and Memories series shows. In a lot of ways Guild Wars is exactly the kind of online RPG I’d love! It has very little to no required grinding and a low level cap, loot is heavily de-emphasized except as a visual thing, the game has a main path that follows a series of linear missions, there is a very satisfying mapping component as you reveal the map, and gameplay is complex and strategic in some level, and isn’t just mindless button-mashing. It also looks great, has no monthly fees, and ran relatively well on my computer’s then-aging GeForce 2 GTS graphics card. However, Guild Wars was not out yet, and the public tests were sporadic. 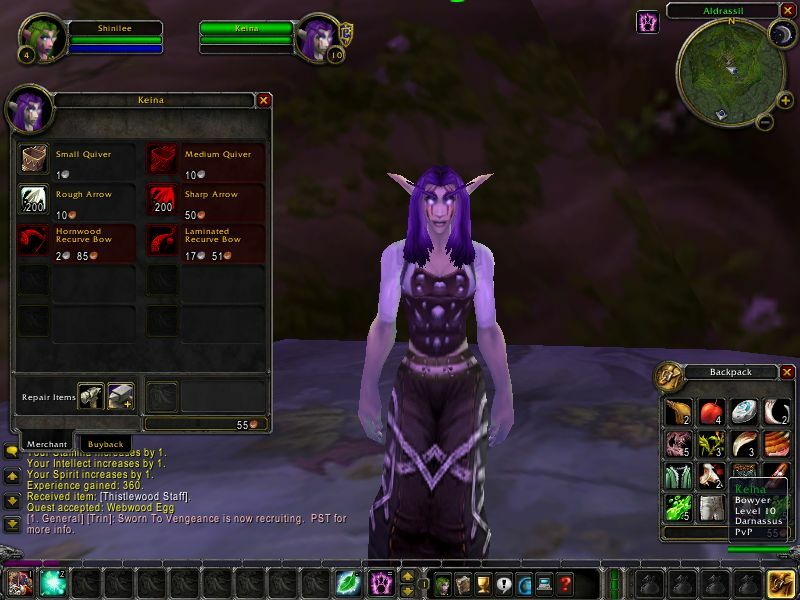 So, in the interim, I tried a bit of a few other mostly free online RPGs, including Saga of Ryzom, ArchLord, a very small amount of Anarchy Online, and, at the end of 2004, the open beta for Blizzard’s World of Warcraft. 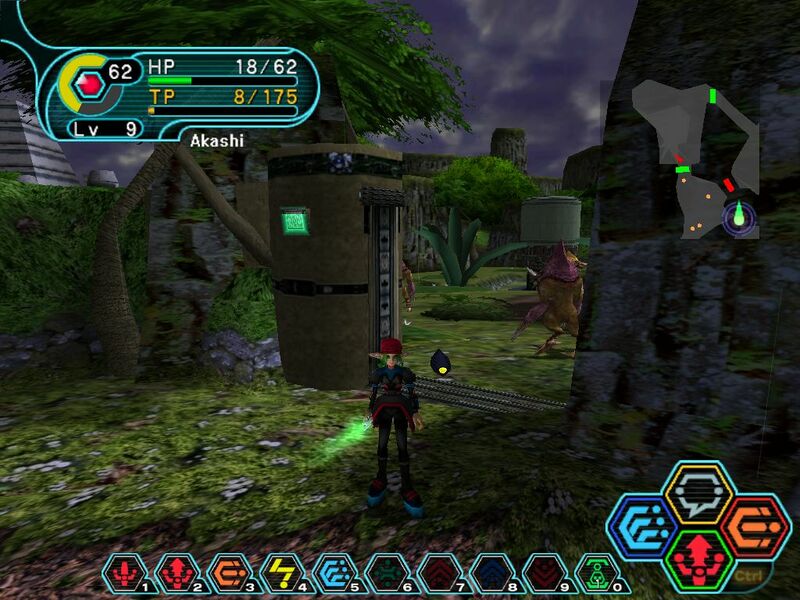 A little later, in 2006, I would also try Phantasy Star Online: Blue Burst, the PC version of the Dreamcast classic Phantasy Star Online. All these games reinforced all of the reasons why regular MMORPGs do not interest me all that much; they’re fine games, but just aren’t for me. I would continue trying them every once in a while, however. Unfortunately I can’t find any screenshots I took in any of them, not from 2004-2005 at least. I do, however, have some shots from a little later, from when I bought World of Warcraft when it was on sale in 2006 and played it for a month. Of those games, the most successful is of course World of Warcraft. Because I was a huge Blizzard fan at the time, particularly of their RTSes — though the game would prove to be the end of that — I did try World of Warcraft when Blizzard had an open beta for the game in late 2004 just before its release. Comparing it to the Guild Wars betas I was playing so much of at that time, WoW had worse graphics, worse art design, significantly worse performance and framerates, and much less interesting, much more solo-focused gameplay. And on top of all that, Blizzard wanted users to pay a $15 monthly fee to play their game, while Guild Wars had no fees beyond buying the box! I liked pretty much everything about Guild Wars a lot better and never considered buying WoW when it released soon afterwards. Unfortunately, I don’t think I took any screenshots during that beta, but I remember making a couple of characters and wandering around and such. So, this article starts later, in 2006, when I played the game again and did take some screenshots. The article has three parts, in chronological order based on when the screenshots were taken. 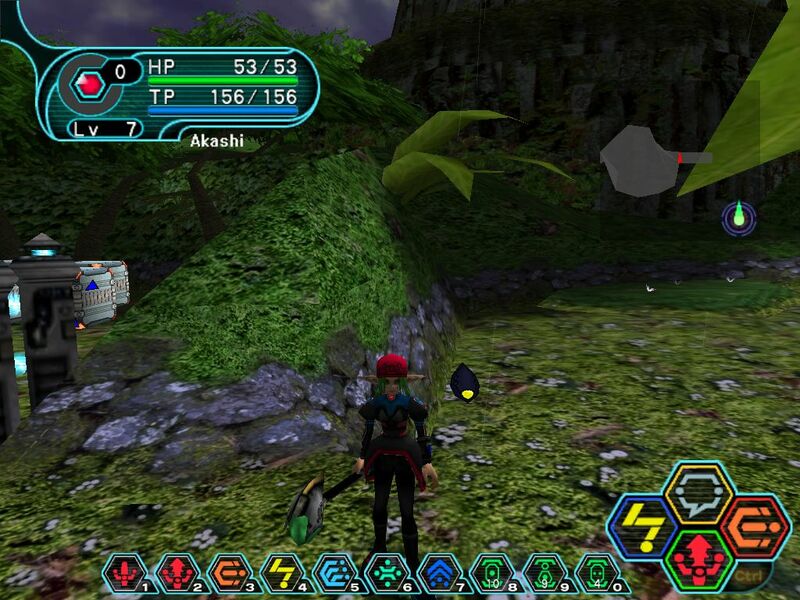 First, Phantasy Star Online: Blue Burst screenshots from summer 2006. 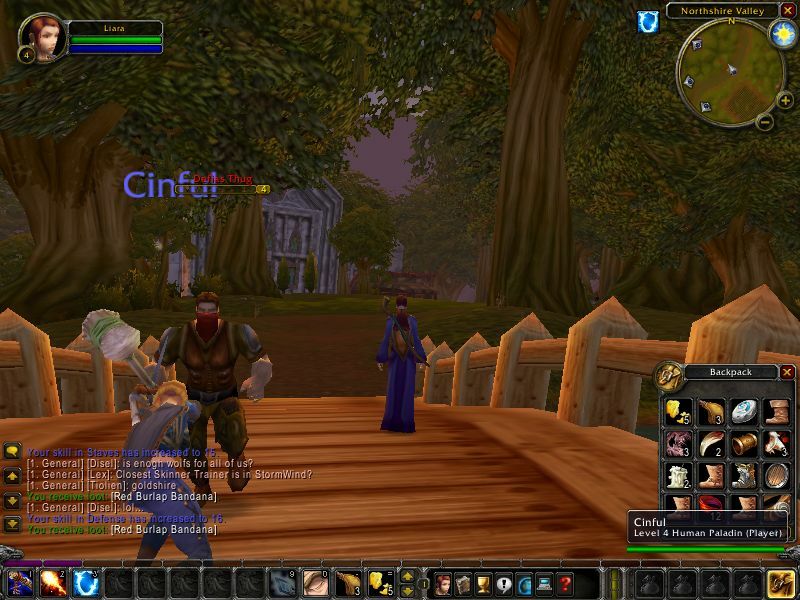 Second, World of Warcraft: Cataclysm screenshots also from summer 2006. 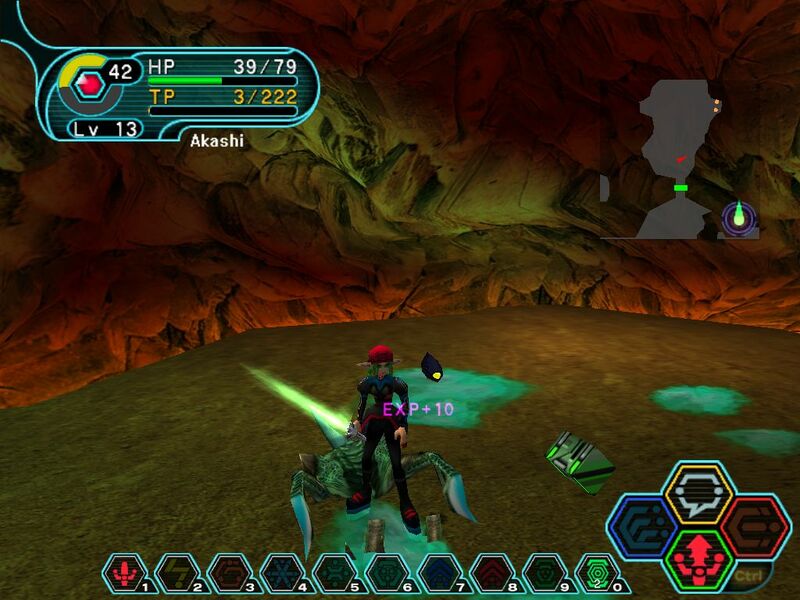 And last, my three screenshots from a PSO Blue Burst fan server from 2008. Guild Wars aside, PC online RPGs formed a consistent formula by the late ’90s, typified by the influential classic EverQuest and, following it, World of Warcraft. 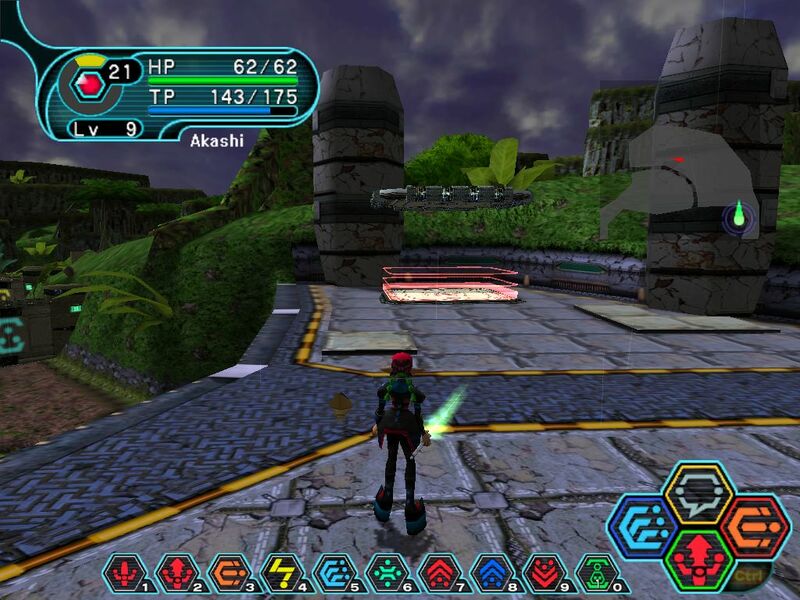 On consoles, however, a different online RPG was popular — Phantasy Star Online, first released on the Dreamcast, and its’ more action-heavy form of online RPG. I did not have a Dreamcast during its life so I could not play it then, but when a demo of the PC version released some time later I did try that out. I’d also tried a bit of a relatives’ copy of the Dreamcast game. 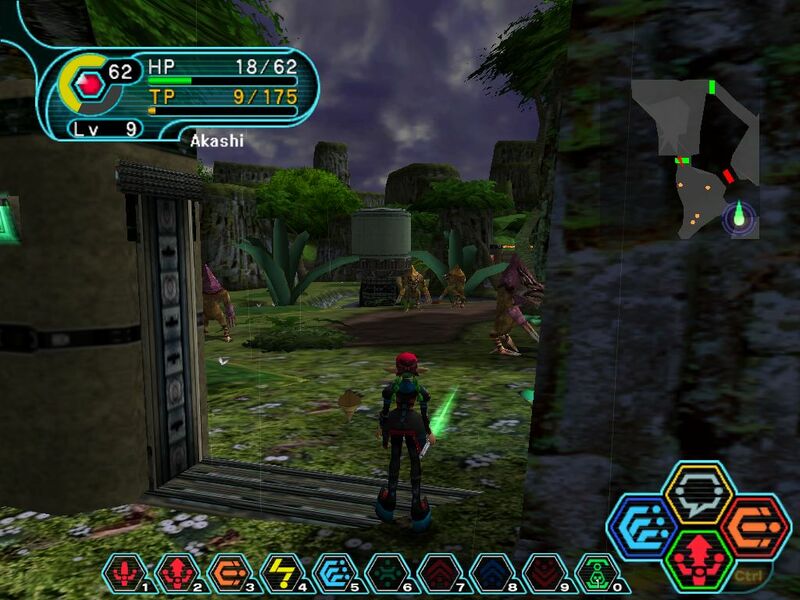 It seemed fun, but not quite enough so to buy for PC when the full PC version, PSO Blue Burst, released in Japan in 2004 and the US in 2005. I did play Blue Burst in 2006, however, but didn’t stick with it. 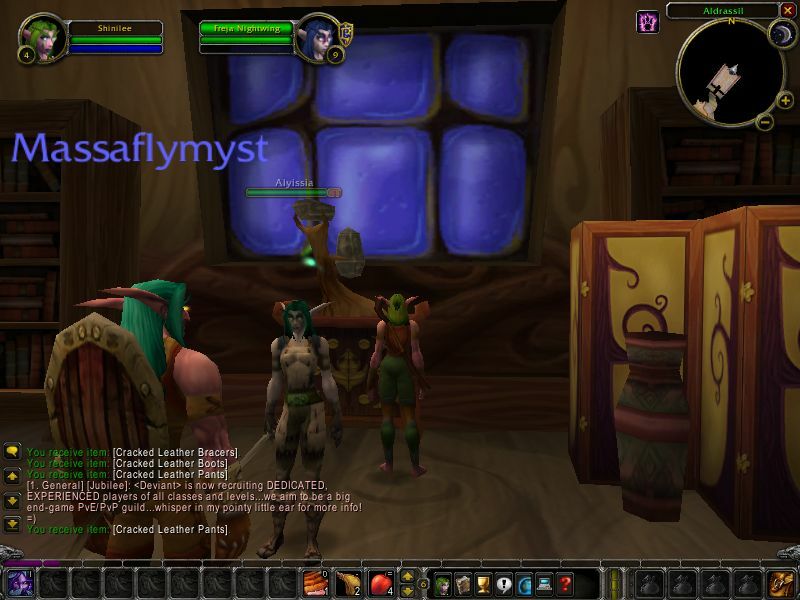 Most of the screenshots below are from when I started a few characters in ’06. The game is fun but very grindey. The grind is part of my issue with it, but that it also had a monthly fee was definitely a part of why I didn’t play PSO more, I did not want to pay every month just for the privilege of playing a game I had already bought! The game was shut down after a few years, but fan servers kept it running. 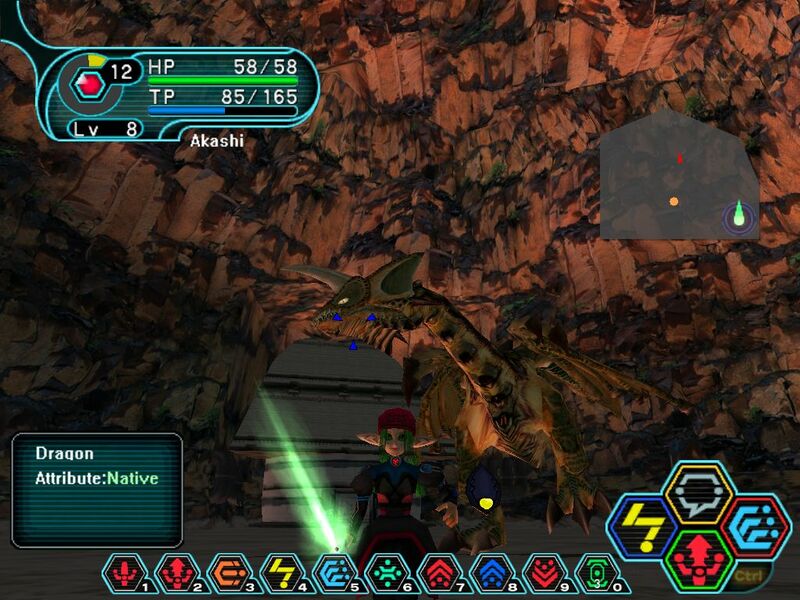 Compared to regular MMORPGs, PSO does some things I like more, and others less. 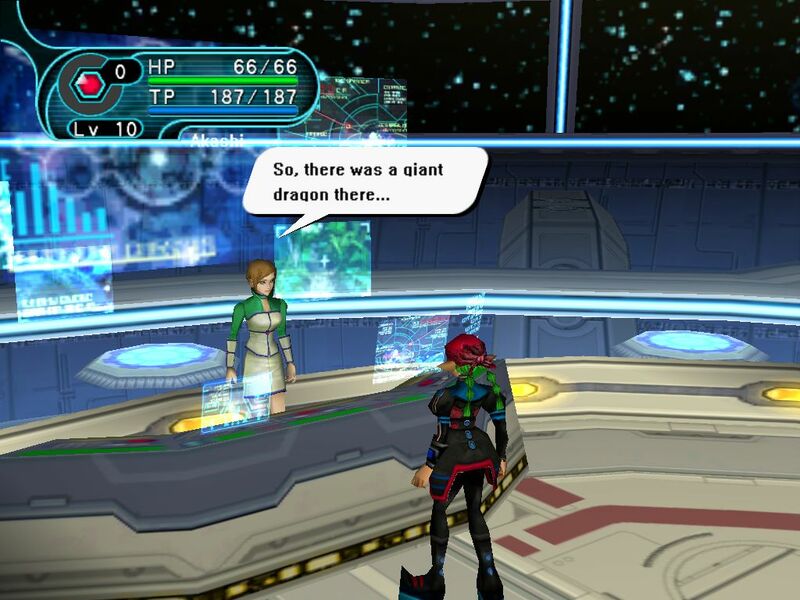 On the one hand, PSO follows a clear game progression path. Each episode is made up of areas, and each area has a map to fight through, a bunch of quests to do in variations of that map, and eventually a boss at the end of each of the four parts of the game. 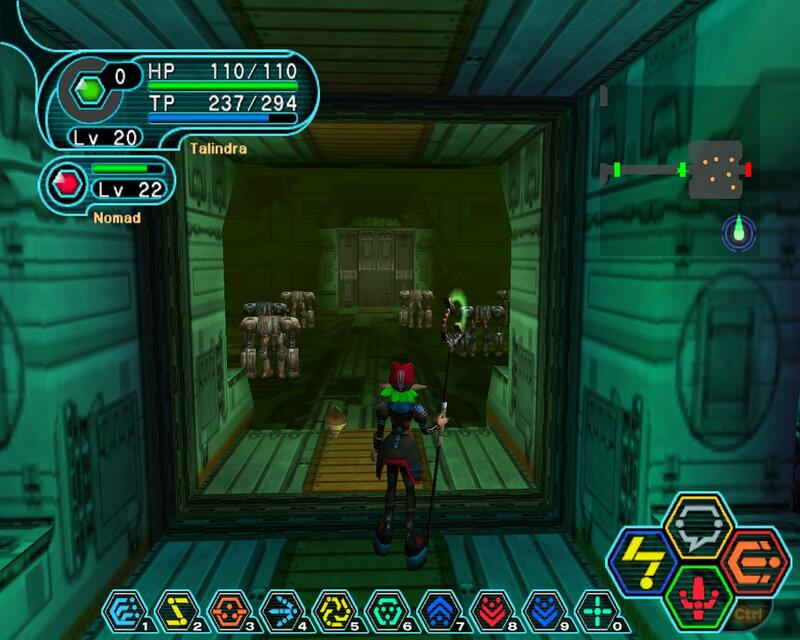 Unlike an MMORPG, PSO areas are very small in size, particularly in the first game; you fight in a series of rooms, essentially, defeating the monsters in each room before you move on to the next one. It works, but you’ll go through each area over and over and over as you level up, and that gets old. The game also very much rewards playing with other human players, as a solo player is at a definite disadvantage against the enemies and especially bosses while team have a much better shot. Your reward for all this? Loot. That’s not really what I want from a game. 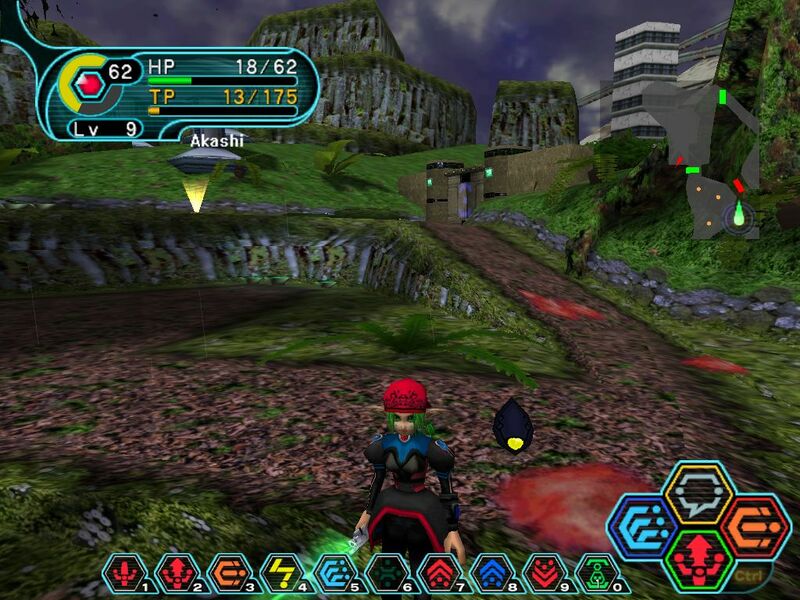 I mean, I do like PSO, but the repetitious nature of its grind hasn’t kept me coming back, though I might someday; there are still fan servers for the game, after all. 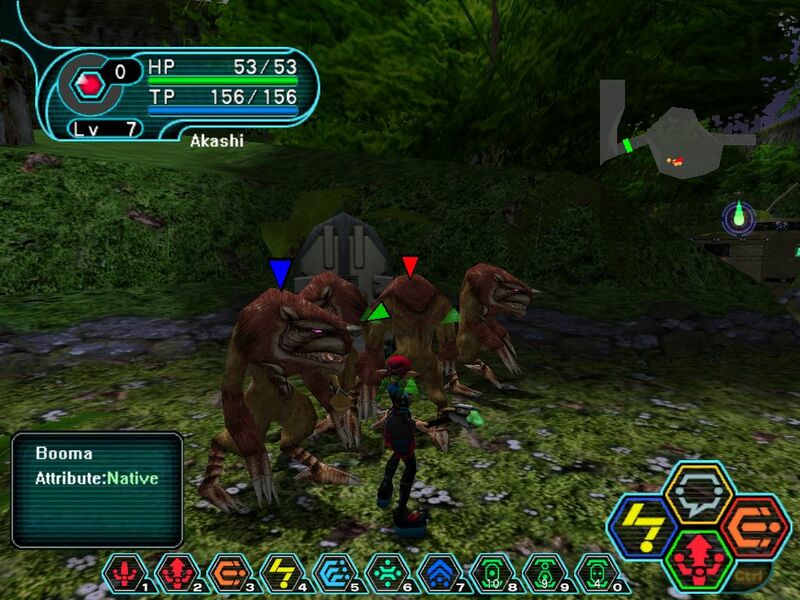 Anyway, these are my screenshots from when I first tried PSO Blue Burst in 2006. I played the game for a bit but stopped, again, in part because of the whole monthly fee thing. So, this is all lower-level gameplay, but I took a decent number of screenshots. This set has 19 images. 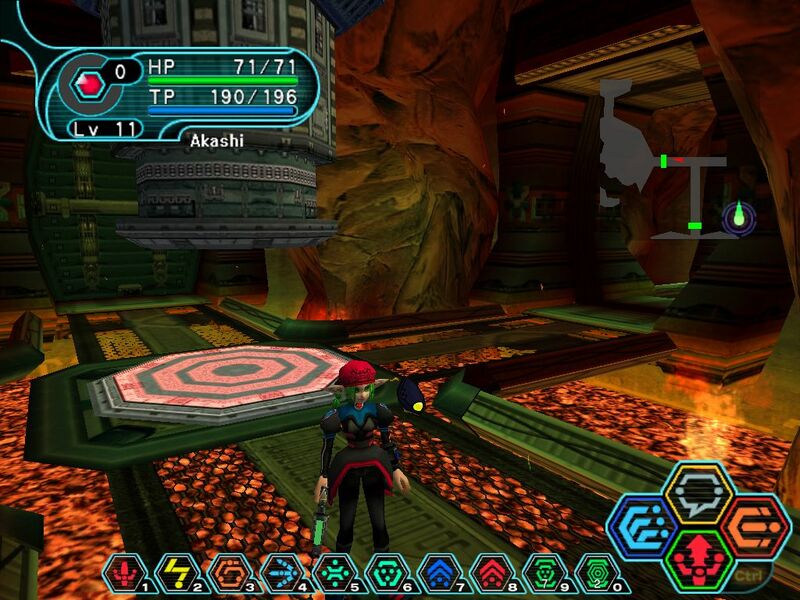 This sure looks familiar; like most of these shots, it’s from the first of PSO’s four areas. You’ll go through each area a lot, fighting the same handful of enemies over and over. Fortunately the core gameplay’s pretty good. This character, like most of my PSO characters, is a FOnewearl, a mage type since that’s one of my favorite classes in games. The graphics are low poly, but it is a port of a Dreamcast game for 2000, so for that time it looks nice enough. It was dated looking by the time this PC version released in the West in 2005, though. 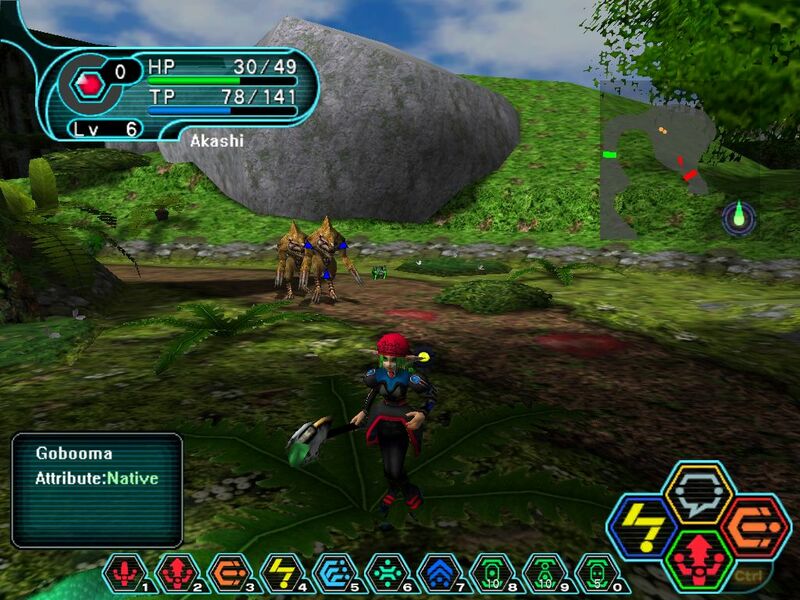 Because it was originally a console game, PSO Blue Burst still has a mostly gamepad-friendly interface, though you can of course play it with a keyboard and mouse. The ten numbers at the bottom are a customizable set of hotkeys, giving you quicker access to a bunch of abilities and items than you would have on console. Meanwhile, the larger set of four icons on the right is the console-style action interface, where you choose an action with one of a gamepads’ four action buttons, or equivalent keyboard keys, and can switch between two sets of four with another button or key. You also can see blue, red, and green arrows over some of the enemies. This shows which enemy you have targeted at the moment and with what. 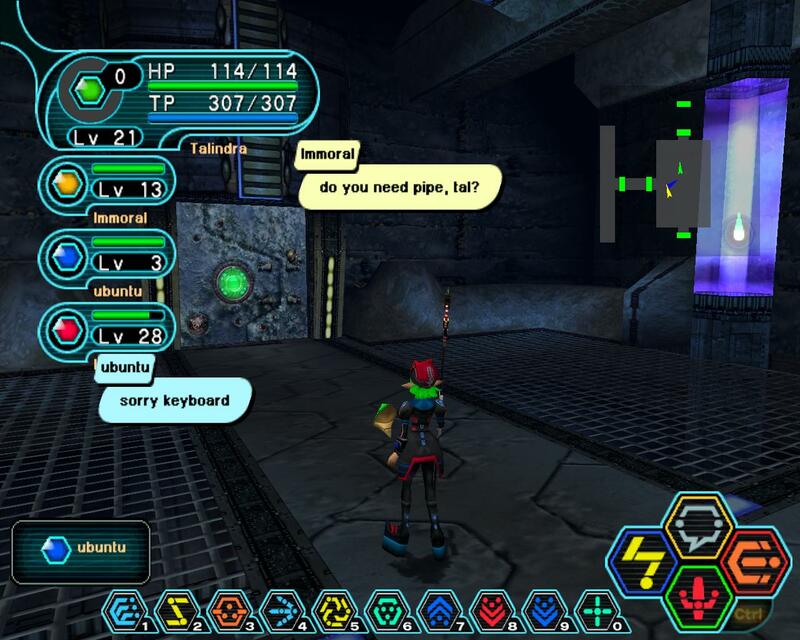 This game has fairly simple controls, but they work well, particularly on a computer where you have easy access to a keyboard; this game relies primarily on text chat, not voice, for talking to other human players. The on-screen interface looks like something designed for a console and the look of the text has an unmistakable ‘this game was not originally made for English characters’ look, but it’s a nice enough interface and works well. And here I have pressed a key to activate one of those abilities, so the arrows over enemies have disappeared and the burning flames are there instead. PSO is divided into rooms. Once you kill all the enemies in a room, you are allowed to go to the next one. At a rooms’ entrance you can see enemies in the next room sometimes, but can’t fight them until you go in. It looks like I survived! That’s always satisfying. Here is the games’ lobby area. 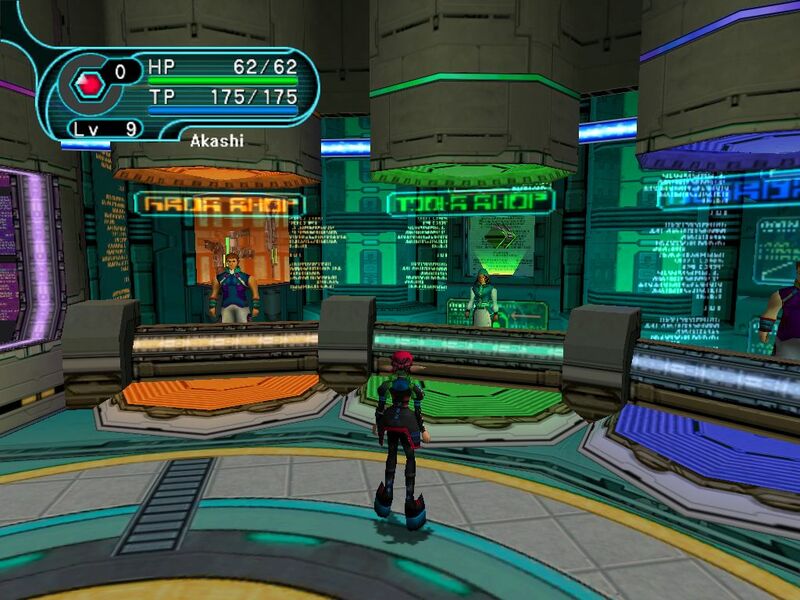 This is the only part of PSO where you will see other human players — much like Guild Wars, the game has a massively-multiplayer component in the town(s), but once you go out of town and take on a mission, you’re either playing solo or with human party members. 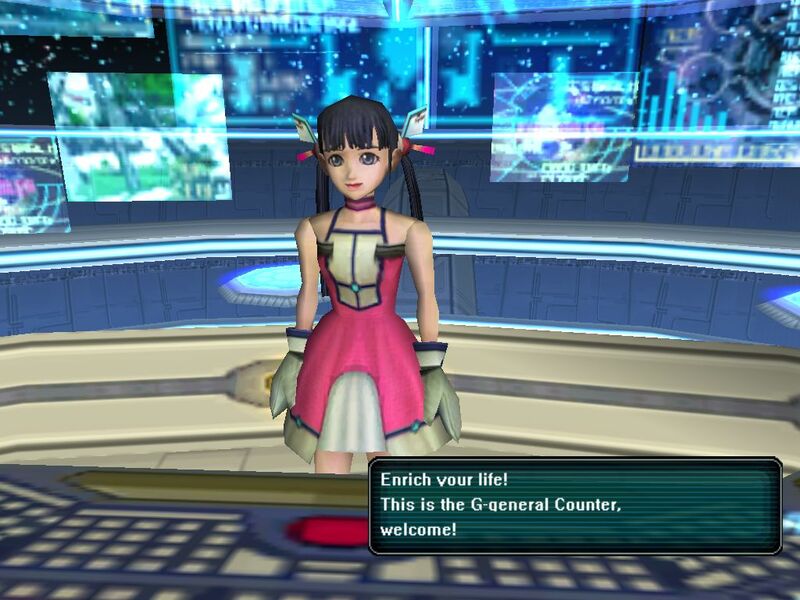 Unfortunately, unlike Guild Wars, as far as I know PSO does not have AI companions like Henchmen or Heroes. That’s too bad, it’d be great. This part of the little town area has the shops in it where you can buy and sell items. You won’t necessarily get the best items and abilities from here, but as your source for healing items and basic skills they are invaluable. Guild Wars came up with a better plan, though, in how it makes consumable item use entirely optional; in a game like this you’re constantly spending money on healing items. This low-poly but sharp look is distinctive of the Dreamcast and has held up fairly well. Of course this PC version has some visual enhancements over the original, but still, it’s a somewhat nice looking game. Anyway, here we’re looking at a portal that will warp us to the level’s boss, I believe. You think? Anyway, this is the mission counter where you get important story quests. This cave area is a little farther into the game, beyond the green first level. This firey cavern is nice to see because after hours of that one green forest over and over, it’s great to finally see something different. 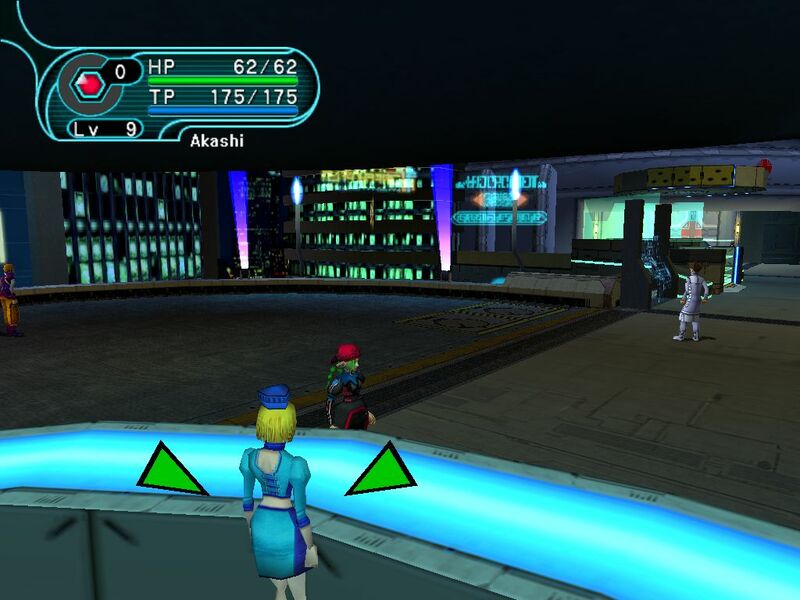 Here’s another part of the lobby, with human players clustering around the mission counter. I had played WoW, again, in the pre-release beta in late 2004, but as with the Guild Wars betas, characters were wiped before launch. However, In November 2005 I got a 10-day key for WoW. However, I don’t have screenshots or memories of playing the game then. Instead, what I do have is a batch of screenshots dated to July 2006. The dates on those files are probably wrong, but I’m not sure when these shots are from between those two dates. This is probably when these screenshots are from. I was never very interested in playing WoW, but because of its success and my past love for Blizzard, I gave it multiple tries, and these screenshots are from my second such attempt. I did not buy the game anytime soon afterwards, but in 2010, when after the release of the Cataclysm expansion Blizzard sold the orgiinal WoW and its first few expansions for $5 each, I did buy the game. I don’t think I have any screenshots from that month, however. If I do, I haven’t found them. I played the game for the month that came with the games, but did not subscribe, so I have not played WoW since 2010. I am fine with that. This time, however, I did take a handful of screenshots. They are all from the starter areas and aren’t very interesting, but here are 15 screenshots anyway. 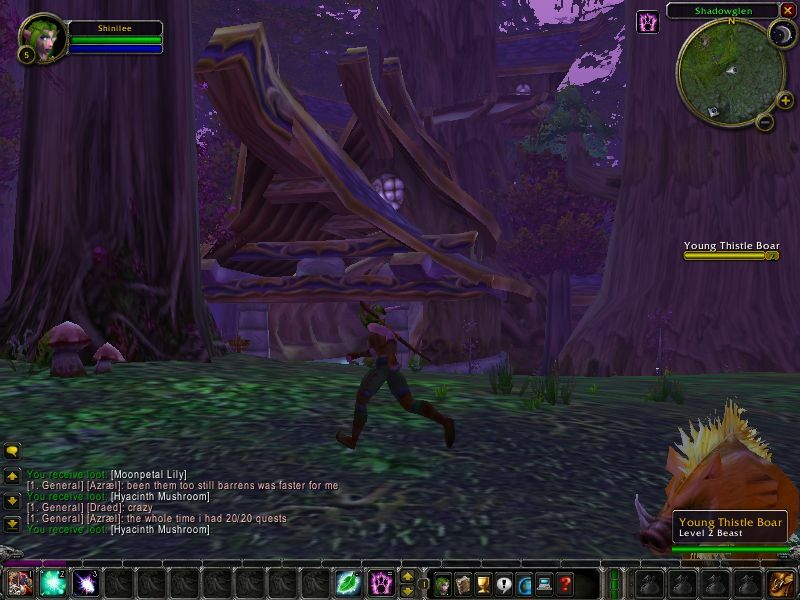 World of Warcraft looks better than this now since it has had visual overhauls, but this is how the game originally looked. I’m running it at only 800×600, lower than the rez I was using in Guild Wars by this point, because of the worse performance. I know I said it already, but framerates in this game were bad for me, despite the blocky and mediocre graphics. I mean, it has some solid art design, though not as great as Guild Wars’, but technically it’s not close to that game. Having to have a huge open world full of players must be holding this game back visually. That’s yet another reason that Guild Wars is better than WoW! Yes, sorry, I know WoW has a lot of fans, and I love Warcraft RPGs, but this game always seemed somewaht average to me… it was fine, but not compelling. If I could play it for only regular retail price I’d play it, but not for something requiring a monthly fee payment. WoW NPCs don’t come close to GW ones either in art design, environment background design, or costume design. Well, to be fair, Guild Wars can be fairly accused of pretty much exclusively having supermodels for player characters. WoW’s characters are also sexualized and exaggerated, but it mgiht be less so than GW. But is it actually less so, or is it just that I so prefer GW’s art design? I think it might be as much of the latter as the former; I remember a controversy about how at some point early on WoW male Elves were changed to make them much buffer than they were originally planned, for example, in order to make them more like what the audience wanted — more attractive characters. Of course any discussion of art is purely subjective though, so there is no right answer here. I made a couple of characters in the one month I played this game, and here’s one, a human mage. WoW, like most MMOs, has a very busy interface loaded with icons, lots of consumable items to buy and use, and lots of skills to equip. The game has been simplified over time, I’ve heard, as far as how much choice you have in selecting skills within each class, but it never had Guild Wars’ level of depth, not even close. Looking at these screenshots doesn’t really make me want to play this game again even if I could, honestly… though that it still has monthly fees is definitely a part of that. Still, though, it is nice that the game has some building interiors, that’s something Guild Wars doesn’t have much of. Combat. As with most MMOs, Guild Wars included, the game uses a skillbar-based system where you activate skills in your taskbar with your mouse or keyboard shortcuts. The more limited customization is less interesting than Guild Wars, though. Sure, it’s much harder to mess up a build here so there is less risk, but the lacking reward is worse. Unfortunately, Guild Wars 2 is much more inspired by games like this one or Phantasy Star Universe than it is Guild Wars, when it comes to how equipping skills works. It’s one of the great shames of that game. I like the Night Elf character look better than the Human… but that might not be a surprise, in Warcraft III I mostly played as the Night Elves in multiplayer, after all. And here we have the second of four screenshots, each with this character in a different costume. Nah, I don’t want to stick with this one, if that is my character. This one is an NPC, not my character. They are somewhat similar looking, though. She’s got starter-tier stuff to sell. This shot reminds me of some of the things I liked about this game. To be more positive about WoW, exploring the games’ large areas and fighting monsters is fun, though. And for people who do have friends in the game, a guild to play with, and such, I definitely see how this kind of game is appealing. I didn’t have that though, and didn’t think I ever would. As a solo game Guild Wars appealed to me more, in part because back then it had much better random grouping options. But even comparing this to GW as it is now, I still like GW’s core gameplay more than the traditional MMO gameplay you see here. Both are good designs that work well though, certainly; I just have somewhat unique tastes for what I like in games, I guess. Blizzard’s signature cartoony art design looks pretty good, too. I may prefer Guild Wars’ style, but this does look good, the environments in particular. These original WoW character models don’t come very close to the GW characters in detail. This is probably just a weird perspective and not a tiny person with huge bookshelves, but I’m not sure… but anyway, that’s all I’ve got for WoW. 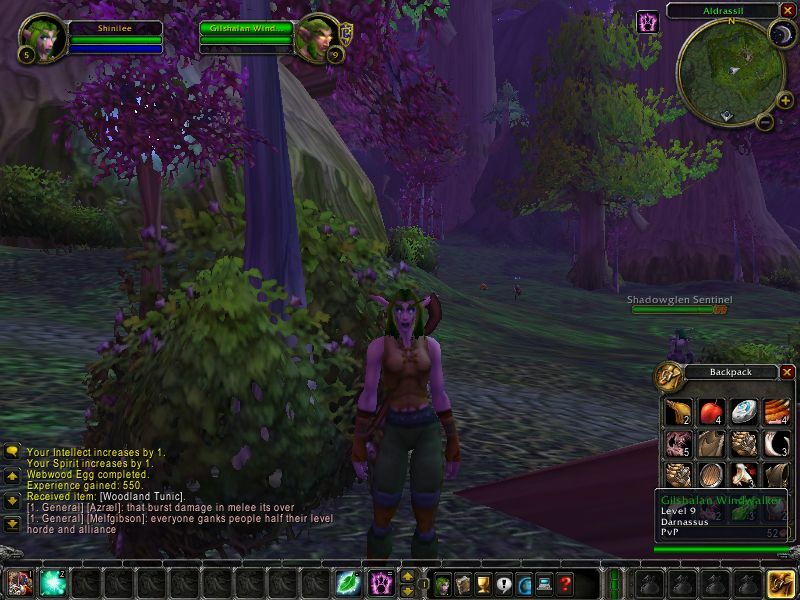 As I said previously, four years after this 10-day trial in 2006, I bought WoW in 2010 and played for a month then. It was the same game you see here, just better looking since I had a newer computer, and I had some fun but did not subscribe after the free month ended and have not played it again since. Overall, World of Warcraft was okay. Running around, getting skills and items, exploring, and doing quests was kind of fun. Some things about the graphics are good, also. It was a totally solo experience for me, though, and I don’t know how I would ever have met other people to play the game with, either. And the core gameplay, all based around grinding and getting items, is not the kind of goal I keep playing a game for. Still, it’s good. I don’t at all agree with the popular pronouncement that WoW is the best MMO ever, but it’s not bad I guess, based on my memories of playing it years ago. In 2008, along with some people from the then-good (and now quite the opposite!) 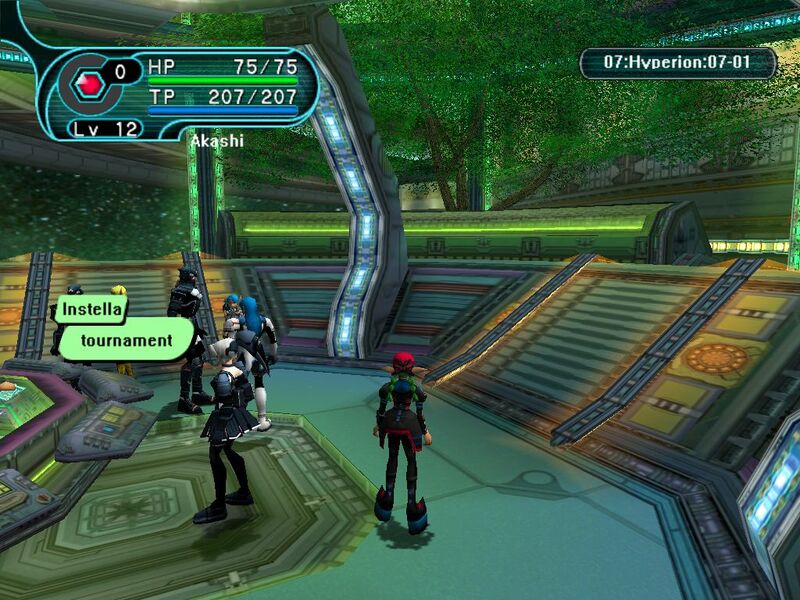 gaming forum Neogaf, I played PSO Blue Burst on one of the fan-run servers for a while. Unfortunately this server deletes characters if you don’t use them for a few months, Diablo 2 style, so my character, like the ones from the official server above, is long gone. Before that happened, though, I played the game with them enough to finish PSO Episode I, which was a nice accomplishment. 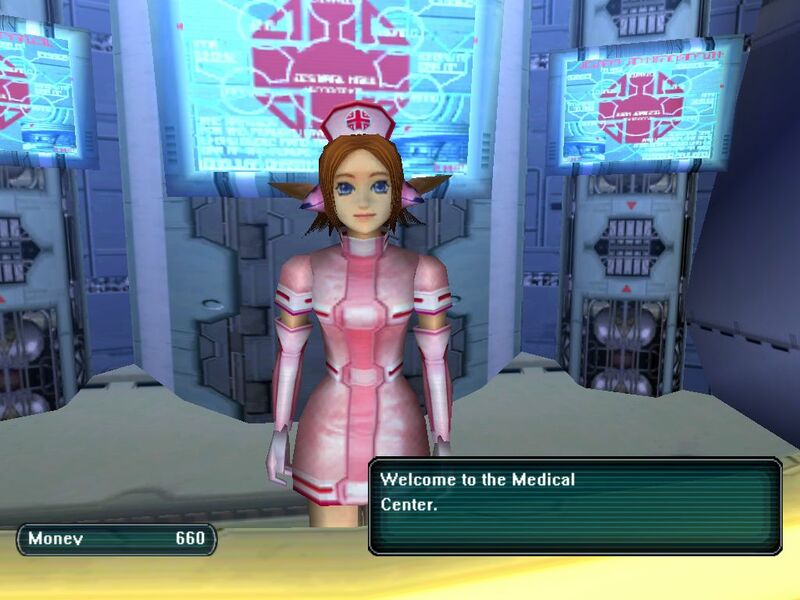 I really wanted to beat the original PSO game, and I did! It was worth the repetition, I think. I didn’t like it quite enough to keep going in episode 2, but if I start a new charact4er on a server which doesn’t delete characters so often maybe I will, someday… though it would be harder solo than when playing with some other people as I was here. Oh well. Unfortunately, I only took three screenshots in this period, for some reason. More interesting are the chat logs — this version of PSO allows you to log all chat when you’re logged in, and I had that on for a while. The old chatlogs are pretty interesting for me to read, but I don’t think I want to share them. So, these three images will have to do. 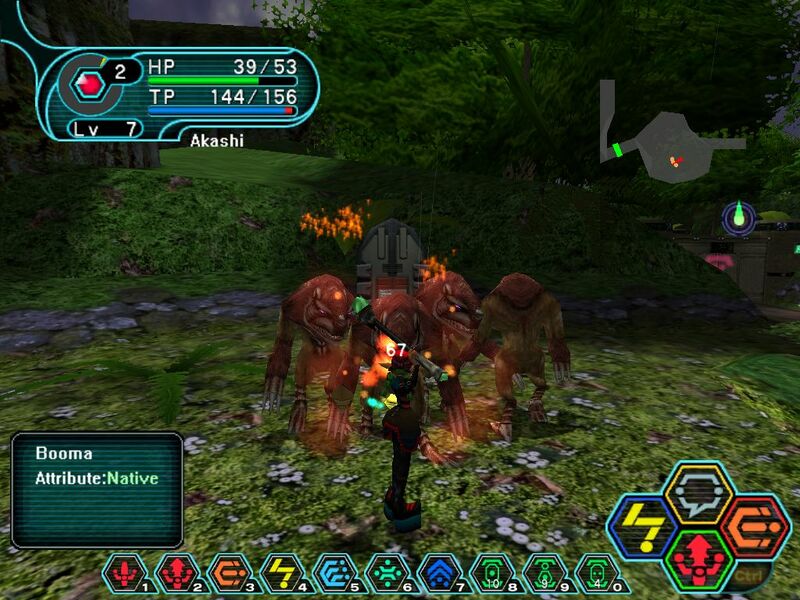 They are higher rez than the previous PSO screenshots because I had a better computer by this point. 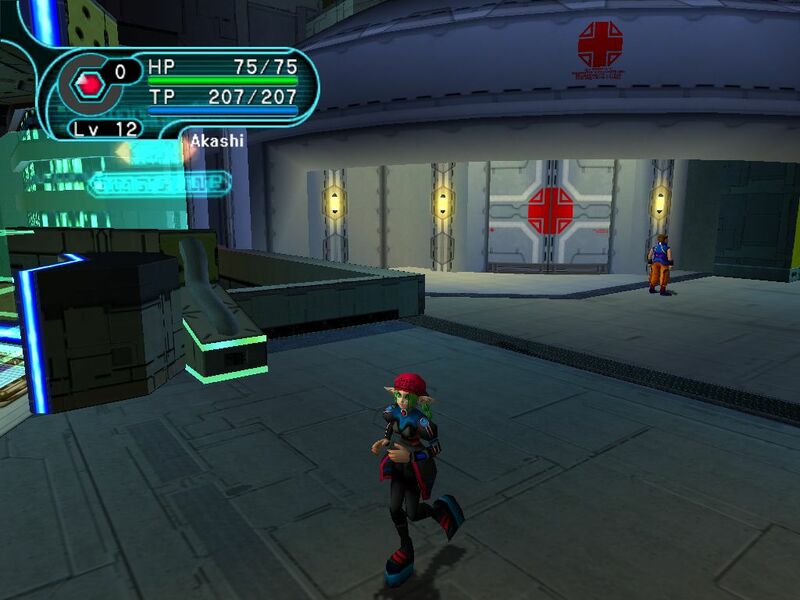 I remembered about the screenshot function fairly well into episode one, clearly — I’m already a lot farther into the game than I was at the end of the first PSO set above. This is the third or fourth area. The game gets tougher as you go along, but the different enemy types are interesting, and when working with other humans it’s more fun than the game is solo. 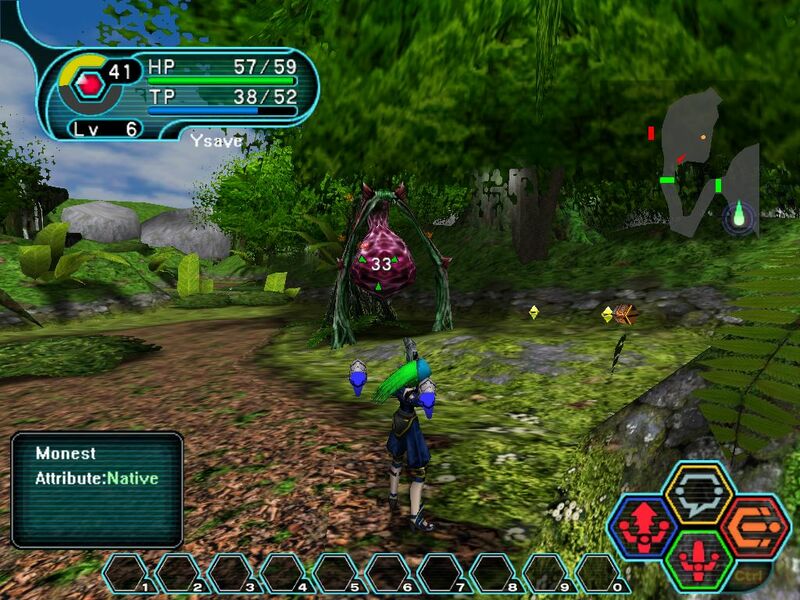 PSO is an alright solo game, but it is a better team one. And here’s the last one. I wish I’d taken shots of the ending… oh well. Still, playing through this was a fun experience.